Agates are an additional find when looking for sea glass in this area of Washington, USA. I know that in Oregon and also other places, I'm sure, there are more agates and more variety. We have heard of "Agate Beach" in Oregon, and there are probably many other "agate beaches." But I wanted to share what you can find in a few hours at beaches in our area as far as agates go. These were found on July 27, 2009. As a matter of fact, I thought I had found a piece of red sea glass. But as you can see in the photo, it actually was a small red agate! When we are looking for sea glass on the beaches near here, we pick up a LOT of other stuff, including driftwood, agates, many beach pebbles or rocks (we try to keep them under 2 inches in size), a FEW seashells, etc. But we ALWAYS find some agates. If you know anything about agates, we would love to hear from you, as we are uneducated about them. Agates are, by definition, banded chalcedony (microcrystalline quartz). The banding can take various forms (and some chalcedonies are named "agate" - moss agate, for one - but typically aren't considered to be "true" agates due to their patterns' lack of banding), but it's inaccurate to say a specific area's agates do or don't have banding. If your pebble otherwise fits the specs for agate but is all one color, you've got a different variety of quartz - which can be equally as beautiful, and sometimes more valuable! That's a good question that many people have and thank you Sarah for adding details to clarify the difference between agates and other chalcedonies. When Lin and really got into looking for sea glass years ago, we heard people talking about finding agates on the beach and didn't have any idea what to look for. Once we saw some samples, we began to identify which rocks were agates. As Sarah mentions, not all "agates" are scientifically true agates. However, for beachcombing purposes, we include many of the waxy-feeling chalcedonies. We are not experts, so to identify exactly what you have found, visit the site that Sarah mentions above and/or do research on the internet (lots of photos there). When you have seen a few "agates" you will begin to spot them easily and quickly. They are usually transluscent, which means that when you hold them up to the light, you can see the light shining through. However, they are not evenly clear like sea glass and many times have attractive stripes or bands running through them. When in doubt, feel the surface. Unlike sea glass, agates have a waxy feel to them. To answer this question in more detail, an agate is a rock (mineral) found in many countries. There are a huge variety of agates and they are very pretty although most are not considered rare stones.. Here on our site we only talk about "agates" (rocks or pebbles) found on beaches, but they are also mined in different parts of the world. Industrial uses of agate exploit its hardness, ability to retain a highly polished surface finish and resistance to chemical attack. The decorative arts use it to make ornaments such as pins, brooches or other types of jewellery, paper knives, inkstands, marbles and seals. Agate is also still used today for decorative displays, cabochons, beads, carvings and Intarsia art as well as face-polished and tumble-polished specimens of varying size and origin. Agates have long been used in arts and crafts. The sanctuary of a Presbyterian church in Yachats, Oregon, has six windows with panes made of agates collected from the local beaches. Agate Beach is on the North End of Newport just off Hwy 101. As a little girl growing up in Newport in the 80's the beaches were all filled with agates. Over the years with the erosion land movement the beaches have all changed. 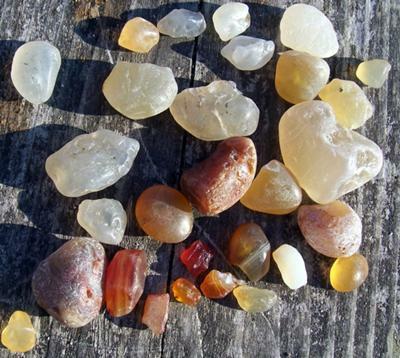 It is very rare to find agates or anything along the beaches around the Yaquina Bay. Just returned from a trip up the west coast...found some agates in Bandon, oregon. Went on to famous agate beach..near newport, oregon...not sure if it was bad timing or what but I would not give you two cents for that beach!!! Horrible access, TONS of sand dunes, very high winds and not a single stone of ANY kind to be found!! Lots of much better beaches all along the coast! I won't go back there! I'm in south central Montana and have collected a ton of gorgeous agates in my own yard. Glendive Mt just a couple hours away..and home to many dinosaurs...has beautiful huge agates. Agates are where you find them! I have found them in E Wa., E Or. and Idaho. Even California! Some of our creeks have nice jasper and garnets. Living in Wa. Now. Have over 100 lbs of polished agates, NW agates. There are blue, browns, eyes, bands, etc. Agate and chalcedony are composed of silicon dioxide but differ from quartz in lacking a continuous crystalline structure. Their structure is considered microcystaline, which results in conchodial fracturing the same way glass does. They can be knapped to produce functional cutting edges. Agates are formed in voids in volcanic rock. They are MUCH harder than the host rock, thus surviving long after the host rock has been eroded away. In my experience, they are also lighter than most other typical beach stones. The combination of hardness and light weight seems to explain how they are fortuitously sorted up to the beach surface by wave action. As almost all Puget Sound beaches are composed of glacial deposits, one would suppose that "our" agates are of mainly Canadian origin. Many have such rounded forms that suggest long periods of smoothing in active rivers or streams - before being subsequently transported south by glacier. Agates DO NOT wash up from the depths of Puget Sound. They erode out of bluffs and enter the "conveyor belt" of a nearshore drift cell. This is the opportunity for them to be beachcombed before being transported off the wave terrace into deep water. In other words, I do not feel guilty collecting agates - if no one finds them, they eventually will be lost into the abyss. As long as there are feeder bluffs to erode, there will be "new" agates supplied to beaches. Bulkheading to stabilize shorelines shuts off the supply of agates along with overall loss of beach sediment. Once only, I turned up an agate in my backyard, elevation approximately 130' above sea level. Very long odds that I don't expect to repeat! from seashore. If w wash it and polish these pebbles it will look really beautiful and it can even use to decorate landscape. My boyfriend and I are agate freaks and just recently started collecting them in the last 4 years. We have close to 2,000 that we have collected near our home on Camano Island and recently started a collection at a place that we stay on Orcas Island. The sizes we have collected on Camano Island range from very small to a little larger than a golf ball. We have inquired with a few different places and have been told that an agate really has no value - but to us; some of the ones we have are priceless. I have a blue one that is one of my favorites and it is about an inch in diameter. We are planning a trip to Agate Beach as we have heard that is a great place to hunt. Where did you find the agate frame. I saw one in Lincoln City, OR and would love to display some of ours. Thanks! I've enjoyed collecting agates since I was a child walking with my grandfather, my favorites are the very clear ones with color, and the ones that have worn to a smooth almost polished egg ready to be in a pendant. The other day I picked up a display frame that has glass on both sides, I placed my agate collection in it and put it in the window, It is a great way to display them. I did a Google on Puget Sound agate geology and found a lot of good information at various universities on the subject. Agates here are uncommon but not rare, same as down there in Whitbey. Agates come from vocanic vugs (holes in vocanic rock) located in the sound which slowly wash up after storms or when you get lucky. WA agates tend NOT to be banded whereas the Montana and Lake Superior tend to have bright banded patterns great for cutting. I have a 1lb agate with very little quartz in it. I can't find anyone who can give me a value. Can anyone help? I guess I don't know what people all know about agates here, but I can share my basic knowledge. I'm from Iowa, we have some nice agates, and further up into Minnesota there are really nice ones. Agates are a volcanic rock, I'm pretty sure made of silica oxide. Silica is what makes glass glass and that's why it has the similar transparency. The nice white bands you see are quartz and many times there's a quartz "eye" in the middle. The eyes are beautiful and prized by buyers. It's pretty cool to think about magma deep in the earth cooling just right to form these beautiful gems. I'm moving to Washington in a week! and can't wait to do some hunting. Many times where you find jasper you will find agates too. Peace and love to you all. This is great information from Karen Bledsoe about sea agates. Hi! We are great fans of agates from Patagonia , Argentina. I am so far up to about half that amount of exactly those colors, sizes and shapes. I love the sport of finding them. My children can spend many hours on the beach looking for glass and have also learned to recognize agates! It's surprising to me that we haven't had any other comments on agates. I know there are a lot of beach glass fans in Washington and agates most of the ones we know also pick up the agates. We don't know much about them except: Old timers have barrels full of them, so they are not rare. There are rare ones but they are hard to find...that's why they're rare! Some of the "common" ones though are absolutely gorgeous. "...for the more commonly seen agates, this is a superb book. "The author clearly describes the formation, various theories for the banding development, what types of rocks have some of the best agates, how to evaluate the agates based on numerous factors (color, shape, luster, banding, pockets, composition, and more), and where to find agates. "Of the most prominent types of agates known, she provides excellent descriptions that are complimented by outstanding images of photographer Thomas Shearer." Did anyone give you sea agate info?? We just moved to Birch Bay and are finding them everywhere. Saw your post, was curious if anyone replied. Be well, fellow beach comber!